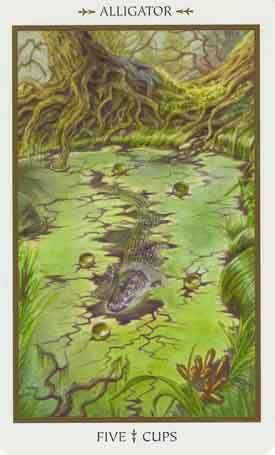 Symbols*: The alligator glides unnoticed through the stifling, moss-covered swamp. It tries to break the surface as a means of accessing the cups but feels entrapped in a pool of disillusionment and regret. It is not sure which direction it needs to pursue in order to resolve its current situation. It patiently waits until it can determine its next course of action. The rocks spill from the bank, thus penetrating the stagnant waters. The erratic tree roots break the barriers between the solidity of the earth and the viscous nature of the murky waters. Description*: Life may not always be what it seems. The alligator reminds us to look carefully at the dichotomous nature of our emotional lives and try to follow our instincts when confronting unexpected changes. As an ancient creature, it has acquired a good facility of primeval instinct and will rely on patience as a means of survival. We, too, need to exercise patience and proceed through negative situations as carefully and thoughtfully as possible. It is impotant not to crumble under emotional duress, which can lead to poor choices. Instead, channel the negative energy in a manner that will enable you to overcome these temporary obstacles in your life. Possible Meaning: Life may not always be what it seems. You may have had to make changes in your life that you are now regretting. Always try to make best of what you have. Every negative can be turned into positive, if you’re willing for it. When an alligator represents itself to you, you will have the opportunity to develop new wisdom but they must be careful not to be consumed by this wisdom. Study each bit of knowledge carefully before going on to the next. Thoughts/Points to Ponder: He is a mystery to me, I can’t figure him out. He is more intimidating than anything else. Yet somehow I feel at ease and relaxed. I guess going back to nature, being surrounded by water does that to me. The Crocodile or Alligator totem contains the unbridled creative forces of the world, the fury and ferocity of Primal Energies. It is the symbol of creation and destruction. The Crocodile or Alligator is the keeper and protector of all knowledge. She is the primal mother in whom all knowledge rests and waits to be born. People with a Crocodile or Alligator totem have the opportunity to develop new wisdom but they must be careful not to be consumed by this wisdom. Study each bit of knowledge carefully before going on to the next. Care of the eyes is important for Crocodile or Alligator people. Also beneficial are breathing techniques like those practiced in Yoga. When a Crocodile or Alligator shows up look for an opportunity to touch very primal energies. There will be an opportunity for new knowledge and wisdom.